Kenya Airways planes at JKIA in Nairobi (file photo). The government's proposal to concession the Kenya Airports Authority (KAA) to Kenya Airways should be outrightly rejected by Parliament; it is a crude attempt at sugar-coating a fraudulent plan to skim public resources. Before it recently capitalised its huge debt to window-dress KQ's balance sheet, the government had a mere 22 per cent shareholding in it. In 2016, it pumped in Sh4.2 billion to keep it a float as other shareholders such as KLM, which owned 26 per cent, simply shrugged it off. There is nothing strategic about having a 'national airline'; many powerful countries, such as the US, Japan, Brazil, Canada, Nigeria, Algeria, Ghana and Zambia, have not lost their pride for not having one. The government privatised KQ in 1997 after it became dead stock in its books. It capitalised its debt in 2017, raising its stake in the airline to 48.9 per cent. It now plans to delist it from NSE and 're-nationalise' it, a proposal even a former board rejected in 2015, saying, "We were there and did not make money until after privatisation." KQ is technically insolvent. It's kept afloat through government guarantees of up to $750 million (Sh75 billion), funding and misplaced largesse, including giving it all state travel business. The company's business strategy and operational ethics are appallingly pitiful. Even as it blames its poor performance on its competitors, the Senate's "Report of the Select Committee on the Inquiry into the Affairs of Kenya Airways Limited and its Subsidiaries 2015" observed that KQ management did not understand "the environment and market they were operating in so as to maintain a competitive edge". 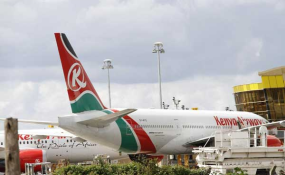 The senators said KQ could not "make strategic decisions in key areas that required constant vigilance in studying global and regional markets and destinations, the vagaries or ups and downs in the oil industry, planning of routes and networks, leverage partnerships with KLM and the Sky team, sale of tickets, capitalising the potential and dynamic of its own local and regional base". Little appears to have changed since. Its CEO says "we either change the mandate of KQ or we sink" and wants to "emulate the success of our competitors, Ethiopian Airlines, Emirates and Qatar Airways, which are all strongly protected by their governments". That reveals a desperate management craving raiding public coffers. The target here is KAA's cash flows; the rest is a smokescreen! Placing KAA under KQ cannot remotely catapult JKIA into the region's aviation hub. KQ even failed to tap into the massive cargo opportunity offered by the huge horticultural export. Ethiopian does not get any funding or subsidy from the government as claimed by KQ, neither does it own or operate Bole, the international airport in Addis Ababa. Africa's largest airline by revenue and profit, it made a net profit of $233 million (Sh23 billion) last year from a revenue of $3.2 billion (Sh302 billion), three times KQ's. Ethiopian would have been privatised much earlier if Addis had an efficient capital market like Nairobi's. Acquired through US Exim bank loans, it has 108 aircraft with 65 on order last year, compared to KQ's fleet of 39. It carried 10.6 million passengers in 2017, more than double KQ's 4.4 million, and is the world's fourth-largest airline by number of countries served. In 2015, KQ paid McKinskey billions of shillings to develop a turnaround strategy and it's unlikely that re-nationalisation or KAA takeover are not among its recommendations. Parliament should reject the PIIP and re-nationalisation bid. The author is a former chair of the Senate's Committee on Finance and senator for Mandera County.